The study is carried out in the lowland of Estonia. Climate in the region is temperate continental (annual temperature ca 5 °C and precipitation 600…700 mm). For the site selection and background information the database about semi-natural grasslands of Estonian Semi-natural Communities Conservation Association (www.pky.ee) was used. All study sites are NATURA 2000 areas. Floodplain and mesic meadows are situated in the Alam-Pedja Nature Reserve (www.alam-pedja.ee). Floodplain meadows (NATURA code 6450) are periodically flooded semi-natural communities situated on the rive banks. These have generally formed as a result of human activities due to grazing and mowing that followed the logging of floodplain forests. There are more than 1000 ha of floodplain meadows maintained mainly by mowing inside the Alam-Pedja Nature Reserve. 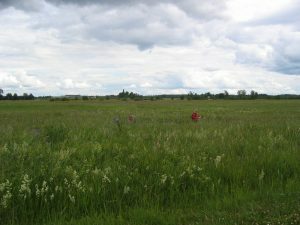 Mesic meadows (NATURA code 6720) are the most common semi-natural grassland type in Estonia, originating mainly from former cultivated meadows or fields. Wooded meadows are situated in the Kaasiku and Padinasaare Special Conservation Area managed by Environmental Board (www.keskkonnaamet.ee). Wooded meadows (NATURA code 6530) are the oldest agro-ecosystem in the temperate zone that has evolved through interactions between man and nature for centuries. Wooded meadows are extremely rich in different plant species in temperate zone conditions, typically also rare species and orchids can be found. We provided a google map with the estonian study sites. Click on the picture to get to the google-maps site. You receive all coordinates and some additional photos.